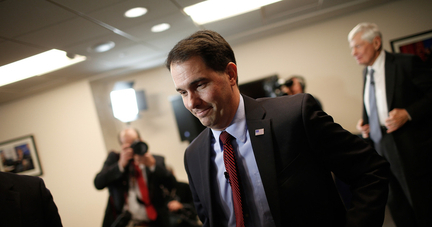 WISCONSIN GOVERNOR Scott Walker, attending a meeting of the National Governors Association, was asked by two Washington Post reporters whether President Obama is a Christian. "I don't know," Walker candidly replied. Wisconsin Governor Scott Walker departs after speaking at the American Action Forum in Washington last month. During the president's reelection campaign in the summer of 2012, the Pew Research Center polled a national sample of registered voters: "Do you happen to know what Barack Obama's religion is?" More than one-third of the respondents — 36 percent — said they didn't know. Only 45 percent identified the president as a Christian; 16 percent said he's a Muslim. That was the seventh time in a little over four years that Pew had measured public awareness of Obama's religion. The first poll, back in March 2008, had yielded almost identical results — 36 percent couldn't name then-Senator Obama's religion, while 47 percent said he was Christian and 12 percent answered Muslim. The Post didn't explain why its reporters thought it appropriate to ask Walker, a possible GOP contender for 2016, about Obama's religion. Nor did it give any reason for treating Walker's answer as if it were headline news. When one in three Americans is unsure of Obama's religious affiliation, why should the governor of Wisconsin be expected to weigh in on the matter? Why should any public figure be quizzed about an officeholder's spiritual beliefs? It is to Walker's credit that he wouldn't venture a judgment on something he doesn't know enough about. "I've actually never talked about it," he responded when the Post pressed him to confirm Obama's Christian identity. "I've never asked him that." Perhaps he should have reminded the reporters that in this country, the theological views of political leaders carry no constitutional weight. "No religious test shall ever be required as a qualification to any office," the Framers specified in Article VI. Candidates for president need not be Christian, and it is not the business of any presidential hopeful to gauge the religious credentials of the current White House incumbent. Nor is it the business of journalists to try to goad them into doing so. "Some figures on the right have consistently questioned Obama's faith, with some suggesting he is a Muslim," the Post story smarmily notes. Even if true, what does that have to do with Walker? Some figures on the left have insisted that Obama is an atheist — but reporters aren't buttonholing Democratic governors to ask whether the president believes in God. As it happens, Obama's religious biography is confusing and convoluted, as he himself has (sometimes) readily acknowledged. 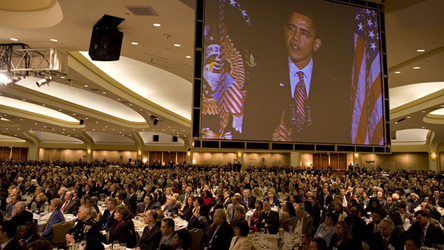 As President Obama, shown here at the National Prayer Breakfast in 2009, has sometimes readily acknowledged, his own religious roots are tangled. It isn't hard to understand why many Americans can't identify the president's faith. "I had a father who was born a Muslim but became an atheist, grandparents who were non-practicing Methodists and Baptists, and a mother who was skeptical of organized religion," Obama told attendees at the National Prayer Breakfast in 2009, two weeks after becoming president. "I didn't become a Christian until ... I moved to the South Side of Chicago after college." In his memoirs, Obama wrote that as a child in Indonesia, he "had spent two years at a Muslim school, two years at a Catholic school," recounting bits of youthful tomfoolery in both. Over the years, the president has made numerous comments on religious topics, and his messages haven't always been consistent. It isn't hard to understand why a sizeable minority of Americans, to the extent that they think about Obama's religion at all, might be genuinely puzzled to put a label to it. Honest confusion isn't scandalous. What is scandalous is when the media spring bogus questions on politicians in an attempt to extract an answer that can then be rushed into headlines dripping with insinuation. There are a thousand-and-one issues on which any national political figure can legitimately be expected to have an opinion. The inner spiritual life of the president — any president — isn't one of them. By all accounts, Walker hasn't the slightest interest in exploiting Obama's faith, and has done nothing to suggest the contrary. A shame that the Washington Post holds itself to a lower standard.